Last night devotees of Lalique and Macallan aficionados joined forces at Sotheby's Beverly Hills auction room for a unique celebration and auction to benefit charity: water, a non-profit organization bringing clean water to those that lack it. The focus of the evening was on a decanter holding 64 year aged Macallan, the oldest scotch ever released by the distillery and the last of the supply. The Lalique decanter, custom made for the Macallan, contains the precious spirit and will be auctioned in New York on November 15th. The Beverly Hills event, which raised $16,000 by auctioning off 2 Lalique glasses and a 10 cl taste of the Macallan 64 to enthusiastic bidders, was only the latest stop in a round the world tour of the decanter to raise funds for charity: water. Over the duration of the ten city tour to date, the most generous bidders were in Taipei, Taiwan, where the winning bidder paid over $40,000 for the 10 cl taste of whiskey and glasses. 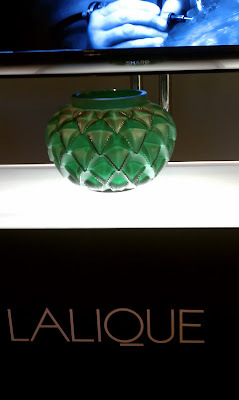 The Lalique decanter and its contents are expected to sell for well into the six figures when it goes up for auction in 2 weeks, so I recommend that Macallan enthusiasts get their assets into liquid form so they can be ready to raise their paddle and write that big check. There is only one decanter and there are no more supplies of the Macallan 64, so this is truly a one time opportunity. The decanter (above) was created using the Cire Purdue (lost wax) method of creating crystal in which wax is modeled into the desired shape, then covered with plaster and baked in an oven at high heat. When the wax is heated in the oven, it melts, creating a void where it was, the "lost wax", and this mold is then used to create the object, by pouring in liquid crystal to form the decanter. 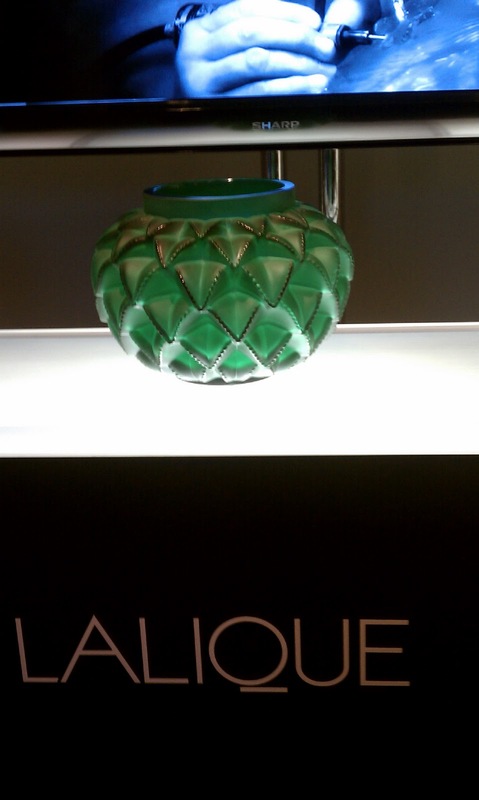 Lalique originally used this method but hadn't used it for decades until this collaboration. 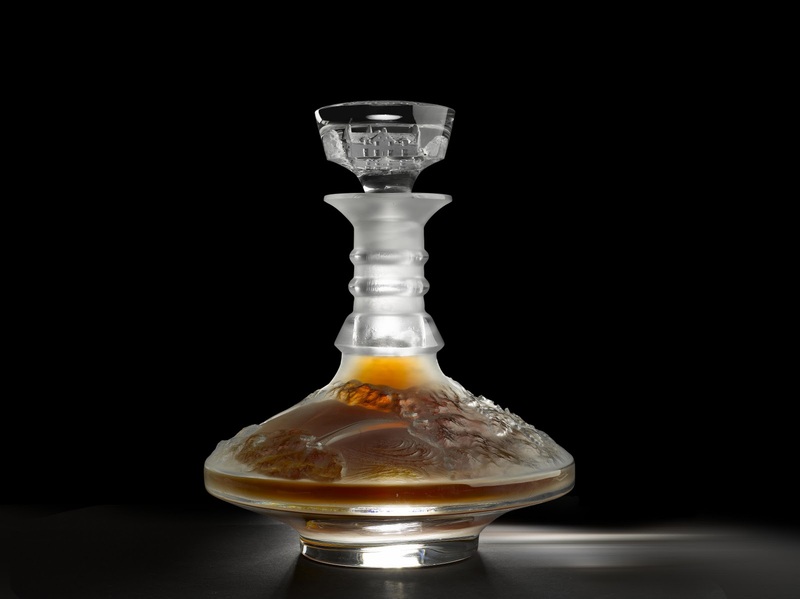 The decanter was designed to celebrate the Macallan estate and the manor house itself is depicted in the stopper. It is not just the vessel but its contents that make this such a unique item. The Macallan 64 is a blend of casks filled in 1942, 1945 and 1946 and is considered 64 years old as age statements reflect the "youngest" spirit in the blend. When I say blended, the Macallan 64 is still a single malt scotch as it is made from one type of grain (barley) at one distillery. Prior to this the oldest whiskey Macallan had released was 40 bottles of a 60 year released in 1986. Auction attendees were able to sample the Macallan 10, 12, 15 and 18, although the highlight of the evening in terms of tasting was the flutes of Macallan 25 that were passed out following the auction. Smooth, intense with hints of citrus and chocolate, this was a powerful whiskey. I can only imagine what another 40 years of aging would do. Chef Rory Herrmann (pictured below with Brand Ambassador Eden Algie) of Bouchon Bistro prepared passed hors d'œuvre, which included beautifully prepared gougeres which were piping hot. 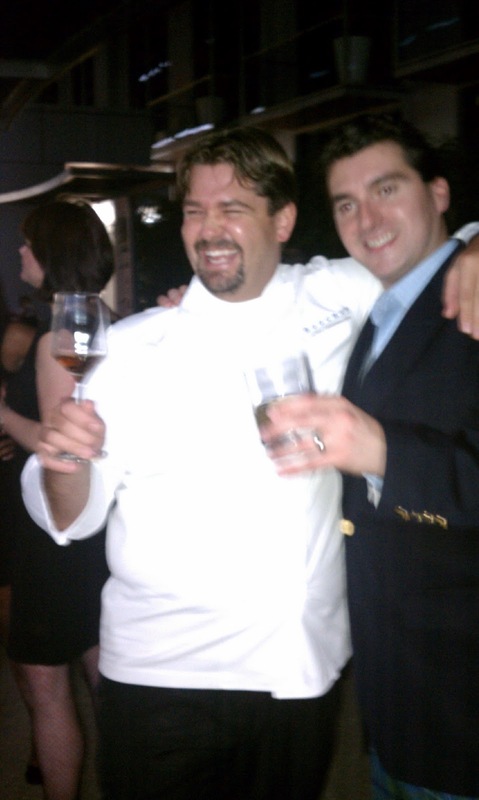 For a sweet treat at the end of the evening, his pastry chef incorporated Macallan 18 into chocolates and caramels. 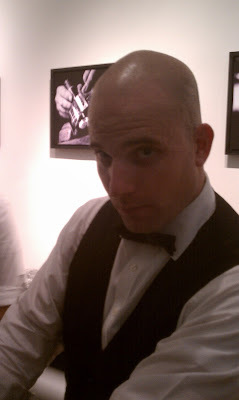 Jonathan Navasartian (below), the head bartender at Bouchon, created two cocktails incorporating Macallan for the occasion, and also poured versions of the classics the Rob Roy and the Blood and Sand. His Mac N' Mary (below, bottom) blended the 12 year with Green Chartreuse, Lemon Juice, Rosemary and Ginger infused Honey, tea and Ginger Beer. Macallan Brand Ambassador Eden Algie led the spirited bidding process as the auctioneer and as he was wearing plaid tartan pants, one bidder offered to raise his bid if Algie would lose his pants. Other bidders prevailed so Algie was able to keep his pants on while raising the $16,000 for charity: water. The winning bidders also received a dinner in their home cooked by Chef Hermann and a Macallan tasting with Algie. Last night's $16,000 increased the total amount of money raised on the tour to date to over $145,000. As the charity: water representative noted that it costs them $20 per person to bring clean potable water to those they aid, the cumulative Macallan 64 auctions have already generated sufficient funds to bring water to more than 7,000 individuals. 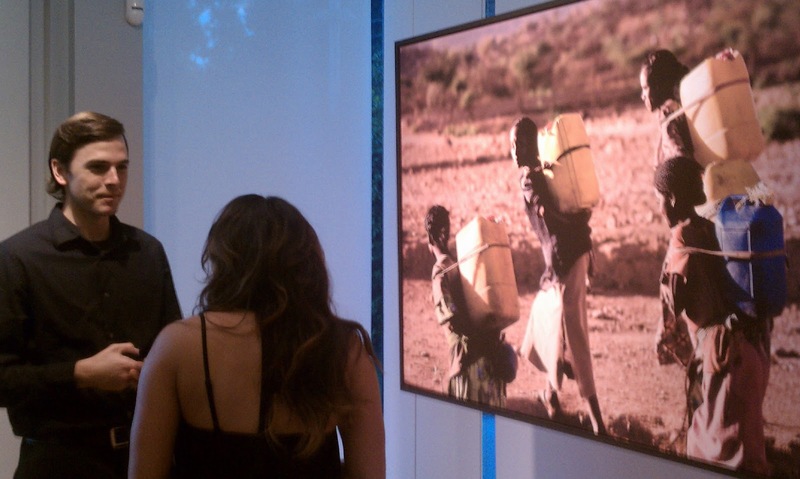 Photographs were displayed in the Sotheby's showroom to remind attendees of where the money raised would go. You can learn more and register for the auction in New York on November 15th here. 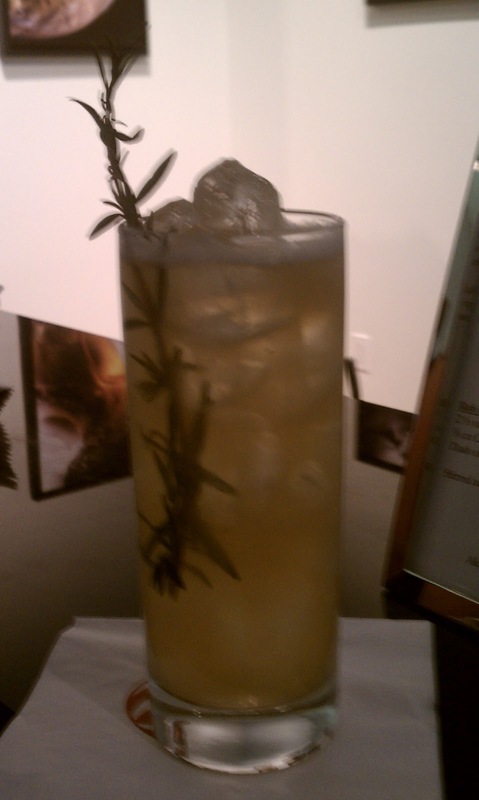 If you are the winning bidder and are feeling especially generous, please feel free to invite me to try a sip.